Sunday Photo; Tapsa – Wake Up and Laugh! This week’s photo is of Tapsa (the Pagoda Temple), tucked between the Horse Ear Mountains, in Northern Jeolla province. It’s been one of my favorite places to visit in Korea, not only for the temple, but for the entire ethereal surroundings. 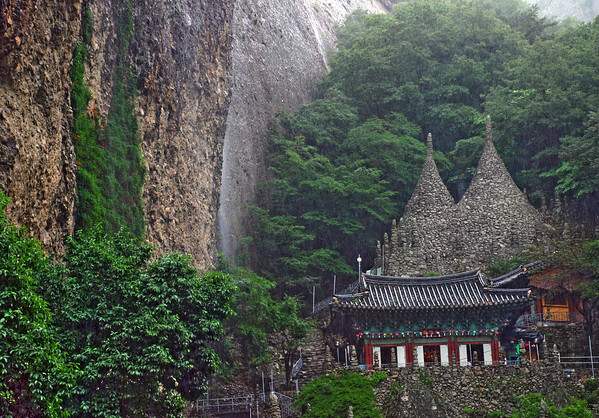 The Buddhist mystic, Yi Kap Myoung, spent the later half of his 97 years on earth piling his stone pagodas and translating Zen in the Orphic-Eaves-Droppings of Korea’s great auscultators. Most of the pagodas are still standing, over 60 years later. The two large ones, just behind the temple, are more than 15 meters tall. There isn’t much information available about him in English, but I read in one of the pamphlets that he spent an entire year sustaining himself from pine needles, apparently not a particularly rare practice during mountain retreats. One of the intriguing mysteries of the place is, if you place an offering bowl of water out on a cold winter morning, an icicle will grow up out of the bowl, pointing to the mountains. Wow! I’ve never heard of this temple but it’s now on my “list!” Thanks, Joseph! haha, it’s not the first time I’ve seen you imply a trip to Korea! I’d be glad to bring you there on a weekend! “ran for refuge” – isn’t it how it often happens, the thunderstorms of life makes you come to spiritual refuge. Ever thought of writing a book with stories (and photos)like that ? but fortunately these are still standing! Actually, Evelyn, that’s the answer everyone else wants to know as well! No one knows how he made the bigger pagodas. Joseph, i love your SundayPhoto-serial! rather inspiring! There’s no plaster or glue in those pagodas. They’re all natural stones that have been fit perfectly into place. Hi Evelyn, sorry for not responding until now… I was away with my family for the past week. Chong Go Sunim answered as well as I could have, anyway.